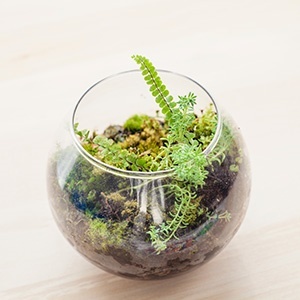 Create a quirky little oasis that will make for an interesting centerpiece in your home. The ultimate low maintenance indoor garden, a terrarium can be made out of any clear glass or plastic container. TIP: It’s more cost effective to buy a mixed bowl rather than individual plants. 1 Place your pebbles at the bottom of the container, followed by a sprinkling of charcoal, this helps absorb the potentially harmful fumes of decaying matter, essential if you plan to stopper the container. 2 Remove your plants from their pots, gently pry the soil from the root bulbs and place the removed soil into the container without compacting it, you want it light and loose. 3 Once you’ve loosened all your plants gently wrap their roots into balls, to make them easier to place into the potting soil. 4 Use your chopsticks to gently lower your plants into the container, then use one of them to push the loose soil around the exposed roots. TIP: It’s best to start with the largest plants first, making your way down to the smallest. 5 Once your plants are in position you can add extra stones, twigs and moss if you wish, and sculpt it to taste. To clean the inside of the glass, tape a paper towel to the end of a chopstick and wipe it down. NOTE: If you plan to stopper the container you need to water it first then seal it, place it in a cool spot where it will receive adequate light and give it two weeks to ‘harden off’. Once you’ve done that you can move it around if you so wish, it will no longer require watering as it then becomes a self-contained eco-system.